Due to vast experience and knowledge in working to certified standards in the oil & gas and marine sectors, the Aberdeen facilities of Quartzelec, the independent engineering service provider that’s globally recognised as an expert in rotating electrical machines, secured and recently delivered an order to refurbish an initial 60 ‘Ex’ certified Low Voltage motors for an Egyptian gas refinery. Looking to overhaul multiple critical processes, the client approached a number of internationally recognised engineering specialists with a view to them developing a cost effective strategy to manage and implement a programme of refurbishment. Quartzelec was able to clearly demonstrate extensive experience in the repair, maintenance and overhaul of Ex machines; including a number of ongoing contracts with most of the major operators within Aberdeen’s oil and gas industry, and on this basis was invited to tender. Several other key factors ensured Quartzelec secured this order. The most significant being its comprehensive understanding of Ex machines, including how to design, manufacture, rewind, repair, re-classify and operate in accordance with modern safety guidelines. Being able to demonstrate the necessary level of attention to detail when stripping and inspecting motors, along with the supporting documentation, and its commitment to delivering solutions within inflexible shutdown windows were also contributing factors. Finally being authorised repairers for a number of machine OEMs as well as having the required in-house testing facilities were also essential to securing the contract win. As part of the contract for the 60 Ex certified LV motors, the lesser known OEM machines were prioritised in the inspection and strip‑down schedule. This meant that any faults with any of these motors were identified first and the anticipated long lead times to source or fabricate spare parts were minimised in the overall maintenance schedule. Thorough resource planning, logistical management and document control also featured throughout the delivery. In a number of instances direct replacement machines needed to be sourced for those that, upon inspection, were considered to be beyond viable or economic repair. These included replacements for several of US origin but sourcing issues could not impact the completion deadlines. 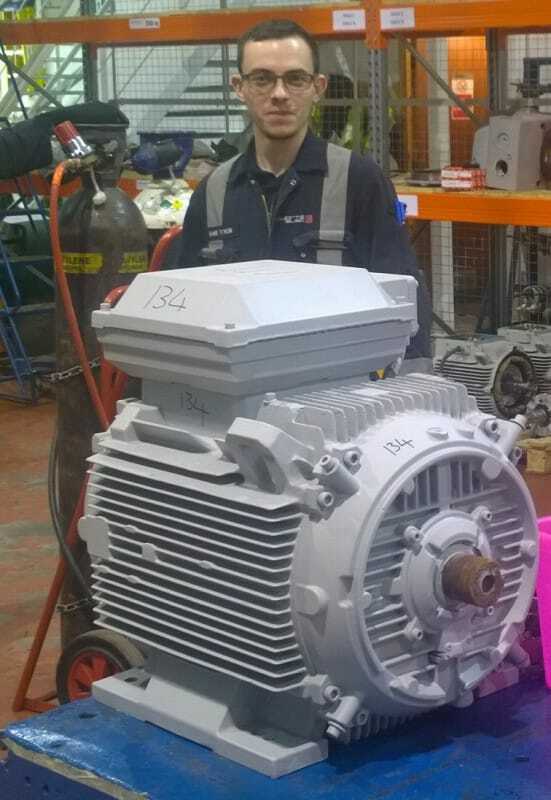 Each of the motors were stripped down and inspected, then repaired as required, before being rebuilt and painted in durable marine finish suitable for a desert/marine environment; with the appropriate Ex certification and documentation being completed, providing the all-important ‘seal of compliance and approval’. Quartzelec has the ability to design, manufacture, repair, refurbish and rewind large, project critical motors and generators with state-of-the-art production facilities along with an extensive library of design drawings and a full design department and has the ability to work on any OEM‑manufactured machine and/or equipment, including those built by its previous heritage companies such as GEC Machines, GEC Alsthom Large Machines, ALSTOM and Cegelec. It also has a rapidly expanding UK electrical contracting business that delivers both mechanical and electrical installation and maintenance services for an ever growing portfolio of prestigious projects. In 2016/17 the Aberdeen facility, which now boasts a team of almost 40 staff, was upgraded to allow larger electrical motors and generators to be tested locally. The work included significantly increasing the size and load bearing strength of the embedded test plate and in parallel the test facility was up-rated along with improvements to the safety systems and protocols to protect staff, which entailed relocating the operation and control elements outside of the testing compound. This year sees the Aberdeen facility celebrating 20-years of operation.